TIG and I were just discussing the ToneWood portable acoustic guitar amp in another thread, and I thought we might generate some chat about some of our favorite gadgets & gismos we like (or would like to have) in this thread. 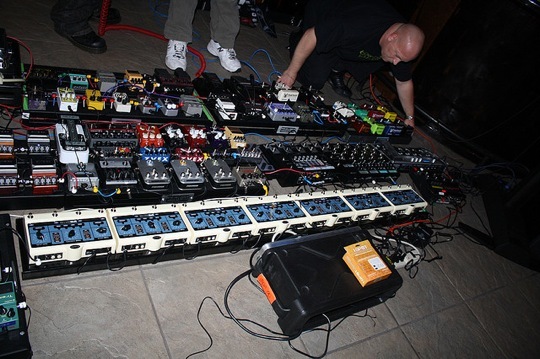 So please talk about / review / dream here, about any of those guitarist's accessories we're certain we can't live without. I have and use at gigs a Boss ME 50. I dream of an 80. At home for recording I use a Digitech RP55 and a Donner Alpha Cruncher also a V Tone BD1 21 for bass. I tend not to meddle too much with pre sets and it's usually wet or dry, except for live solos if I need distortion or boost. I LOVE MY TOYS! posted pics of the board i made after Christmas for gigs, but my two primary things, my Digitech RP 500 and my A/B Y box. Then of course the 100W Bugera head and 4X12 cab LOLOL! Amp is so good I hardly even need the RP ! I have a Boss RC30 loop station that I haven't even tried to use yet. That's the extent of my Gizmos. KISS (keep it simple, stupid) has always been my philosophy. They're both in the same ball-park price range (about $400 here in Canada), and both allow at least two loops, with lots of capacity. I'd like to layer guitar, keyboards, and bass, so both of these features are important. I also like that they each allow for two instruments to be plugged at the same time, and both will also accommodate a microphone. Ease of use will also be a big deciding factor. UJB just mentioned he has the RC-30, and I'd appreciate hearing about what you like / dislike about it. 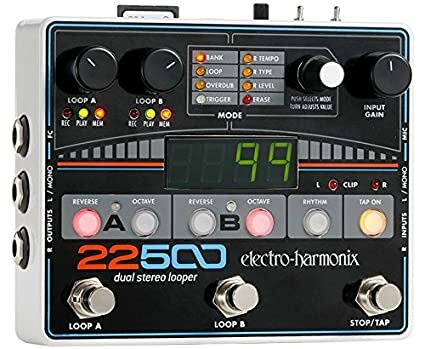 Also, if anyone has the EHX 22500, some intel on that gizmo would also be appreciated. 2) Ibanez "Weeping Demon" ( https://www.musiciansfriend.com/amplifi … -wah-pedal ). Both had a better range of tone adjustments, and didn't sound too thin at the top end. The big feature I finally liked best was the quick & easy bypass switch on the Ibanez, so it can be removed from the signal path without looking, or without the annoying toe-forward switch many have. Glad I got it when I did, 'cuz they don't seem to be making it anymore..
A guitar repair / maintenance workstation is almost indispensable. For changing strings, cleaning, replacing parts, neck setup or adjustments, etc. it's the safest way to work on a guitar without it falling. There are many different types, from the basic Fender mat & neck cradle ( https://www.sweetwater.com/store/detail … rk-station ) to StewMac's "Erlewine Neck Jig"
( https://www.stewmac.com/Luthier_Tools/T … gKMGPD_BwE ). I've got a home made contraption which is compact and works well ... what do you use? 1) Fender --- I haven't owned a Fender guitar for years, but I was never really a fan of their various tremolo systems. The ones I used didn't stay in tune well, and they don't have a very wide pitch range. Good for some subtle shimmer / wavering, but not much more. 2) Bigsby --- their roller-style tremolos are okay for adding some "shimmer" here and there, but not much more. They're also notorious for reducing the amount of sustain. They're very easy on strings (no stressing across a fixed bridge) and also easy for changing strings, comfortable in the hand, and require very little adjustment. 3) Floyd Rose --- the Floyd's offer the greatest amount of pitch change, usually being able to pitch up 5 tones, and down a full octave. The strings can be locked down in the Floyd itself, but a locking nut or locking tuners are a necessity for tuning stability (I prefer Grover 106 locking tuners), because a locking nut requires making a few holes in the headstock joint, which ultimately weakens it. The Floyd's are also hard on strings, as they're being stressed across the fixed bridge every time it's used. A few years ago, a machinist named Eric Stets came up with a tremolo design, that could retrofit any guitar without any modifications to the guitar itself. Our own Russell Harding first introduced them to us several years ago on Chordie, and I'm glad he did (thanks, Russ!). The "Stetsbar Pro II" has similar range to a Floyd, but the bridge floats with the strings so there's no string stress. They simply bolt into the existing bridge holes on most guitars with ease. I've retrofitted a few guitars with them, and we agree that it's the best of all worlds. I installed one on a Gibson SG for a friend, and the extra few ounces of weight pretty much eliminated the imbalanced neck-nose-dive SG's are known for. Add a set of locking tuners, and you're all set. When one uses a loop system.wah pedal or rotary speaker, is it then necessary to have an amp powerful enough to drive it? As you can tell, I don't know too much about ancillary devices such as these, but I am wondering if my 15 watt Fender paired with one of these things would be enough - volume wise? The only pedals I have are an old Boss Fuzztone and a Harmonix Chorus one and these work fine with 15 watts. I can picture a "cartoon-me" onstage with an array of pedals in front, a Fender Strat on my shoulder and a small 15 watt amp behind. Somehow, it just doesn't seem to "fit" together. Wah pedal will work just fine with that amp Bill and of you need one I’ll mail it to you. I have 4 that I don’t use. Tf I use a Clyde deluxe now. It’s great but takes a lot of dialing in between the input volume and buffer circuit.